Rebecca Scanlon was a student on the Chantry School Full Associate Programme from mid-way through the 2013-2014 academic year until the end of the 2015 academic year. At the time of joining the Associate Programme, Rebecca was also in full-time vocational training at Elmhurst School for Dance, and was actively seeking to have a professional career in dance. Following her graduation from Elmhurst, Chantry Dance Company (the professional company that incorporates Chantry School as it’s official school) offered Rebecca a position as an Apprentice Dancer. She danced with the company in their 2015 Autumn season, taking on a character role and ensemble work in the ballet ‘Vincent – a stranger to himself’. Rebecca then spent a year with Northern Ballet and is now working with Chantry Dance Company in a full company member role. Chantry was delighted not only to have assisted her in her dance education, but also her first step into the professional world. “Auditioning for Chantry Associates was a turning point in my dance education. Previous to dancing with Chantry I had a predominantly balletic background but wanted to branch out into other styles. Rae and Paul not only taught how to use my body in new ways but also taught me and helped me grow my own choreographic ideas. Without Chantry Associates I would never have been able to even apply for some of the projects I have been lucky enough to be involved in and their teaching has changed my whole career trajectory for the better. Padua Eaton was a student on the Chantry School Full Associate Programme from September 2013-2014. At the time of joining the Associate Programme, Padua was also in full-time vocational training at Elmhurst School for Dance, and was actively seeking to have a professional career in dance. 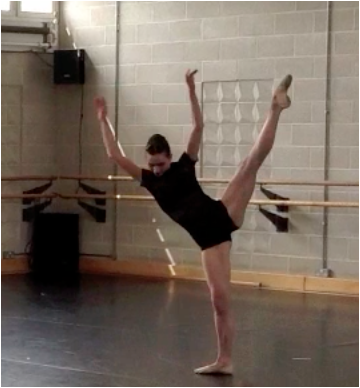 In 2015 Padua attended the Chantry Summer Intensive, and let us know that she had been given a place as a trainee dancer at Orlando Ballet in the USA. This was a great step for Padua and Chantry was delighted to have assisted her in her dance journey. "What you do for all your students is allow them to be themselves, you give them the platform to take risks and not feel judged...and because of that your students flourish"
"Ollie has loved the week and learnt so much from it , we would recommend you to anyone." "...had a wonderful experience this week on the Summer Intensive. There was a new definition and crispness to her dancing this afternoon and I haven't heard her sing to an audience since she was in junior school. She must have felt very safe and supported to be that brave." "...travelled to a 'Summer School' for three of the last four years and Chantry has definitely been her favourite. She will be back next year." "Lucy had a wonderful week ... in her words 'I learn so much and I love it'". "Thank you so much for such a fun and challenging week at @chantryschool_cscba Summer Intensive. Can't wait to be back soon!" "I have thoroughly enjoyed every second it's been amazing! You truly are an inspiration and I am so honoured to be part of such an incredible school." "LOVED every second...next year make it 2 weeks!" "I love you Paul and Rae. Thank you for everything you have done for me. You inspire me." "A week full of creativity, positivity, hard work, new experiences and energy." "I love Paul and Rae! Really enjoyed the classes and definitely felt pushed. The week went so quickly and I really wish I had more time here." "Loved every second of this week. I love Rae, Paul and Gail so much. Thank you." "Rae, Paul and Gail are all inspirational. Thank you for your energy!" "I have learnt so much from dancing with Rae and Paul and everyone at Summer School this week. I love how accepting and positive you make everything. I have hardly stopped thinking about Summer School and my journey this week, I'm still completely amazed by it all!" "....this week was such an amazing experience for me and I really felt yours and Paul's support trying new things and exploring the body in new ways....invaluable experience....during your improvisation classes I felt really free and open to explore my body's movement and expression.....I found the whole process really enjoyable and free and working with you both has been a big inspiration"
"For me the experience of dancing on stage for the first time under the direction of professional dancers was very special. In Realizing a Dream 12 Sept 2013 I wrote: "Dancing to real ballet music in a real studio in a real ballet school. Imagine!" Yesterday was the culmination of that dream and it was one of the best days of my life." "Challenging, liberating, intelligent, instinctive stuff, and, most importantly, useful!" Joe Spurgeon - workshop participant. "Chantry Dance Company tick every box as they approach the work in a thoroughly professional manner and have a plethora of experience that is so vital to be able to impart to our students. The girls are aged from 13 to 18 years of age and are always keen to welcome Chantry back to our studio for a brilliant workshop of really diverse and interesting work that is presented in a completely professional manner." Felicity Redgrave - Principal, Bristol School of Dancing. Rachel Linthwaite - Principal, Dance Attack, Sutton Coldfield. "The movement classes were a massive eye opener for me, I never knew how little I used the space around me to my advantage. It taught me to be more open and to truly let myself go. We learnt to consider movement as a primary source to get into or develop character, sensational class. Amazing! " "Rae Piper and Paul Chantry, thank you for a fantastic day. You were both great and loved the contemporary and Cabaret number that you taught the students. Can't wait to have you and your company back with us soon." Sharon Lyndon, Founder of Love Dance Events. "Thank you Rae for your inspirational workshop and for travelling to us. We would love to hold a another teacher's workshop in the near future. All the best with everything! Lovely to meet you was an honour." Miss Rachel F.I.D.T.A & MRAD Principal, Pink Academy. Lisa Burgess - AISTD, MAAD (Hons), Company Director Star Academy Limited.